$49 for a Windows 10 tablet? Could this be a serious competitor to Amazon’s Fire? I decided to find out. Once I got it home, I let it charge, booted it up, and signed in with my Microsoft account. Then things got a little weird. 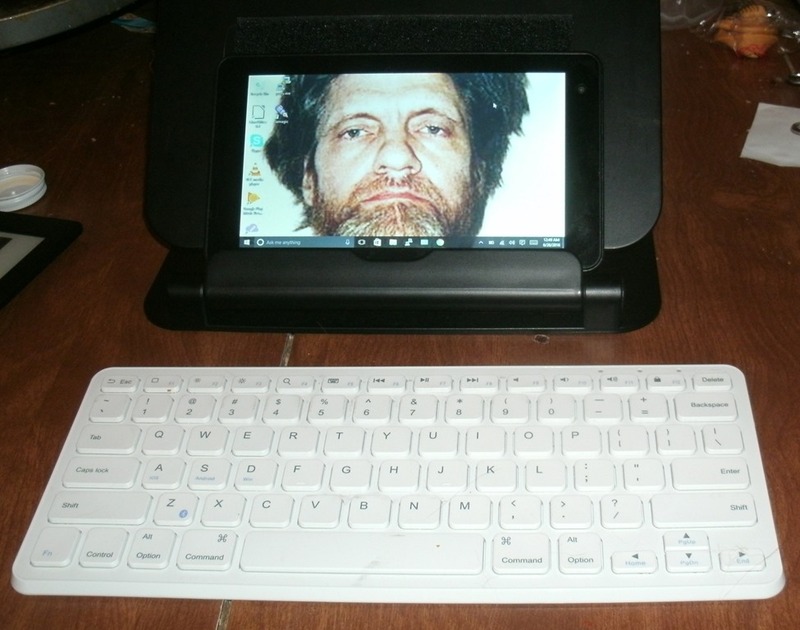 The first face that greeted me on the tablet was—I’m not kidding here—the Unabomber, Ted Kaczynski. Or, more precisely, it was the photo of him I used in the TeleRead story I wrote about him and Scientology last year. I have to say, it’s a bit unsettling to turn on your new tablet and come face-to-face with the most infamous luddite of our age. As for why it was there, it seemed that a number of photos had somehow come with my account login to my desktop theme. Apart from Ted, there was also the photo from this TeleRead story about SeeBook, a photo of my brother’s messy basement, and a painting of medieval knights that may also have been in a TeleRead story somewhere I suppose. I’m not sure exactly where any of them came from, because they weren’t in any of my OneDrive folders. When I asked about it on Microsoft’s support forum, I got a boilerplate response from an MS rep suggesting I run a virus scan and change my Microsoft account password. Not terribly helpful, given that I already knew I hadn’t been hacked since the photos were familiar. Someone else suggested I check and see if I was set to a “Synced Theme” in the Themes control panel. It turned out I was—but when I checked it on my desktop Windows 10 installation, I didn’t see any of those pictures on the Synced Theme there. And then I didn’t see them on the tablet, either. I suppose it’ll just remain one of those curious unsolved mysteries. Perhaps I did something involving them when I briefly had the HP Stream 7 that didn’t work properly with WiFi? I’ve since played around with the tablet for a couple of days, experimenting with it. There are some pretty good things about it, and some similarly pretty annoying things. One of the best things is, of course, the price. 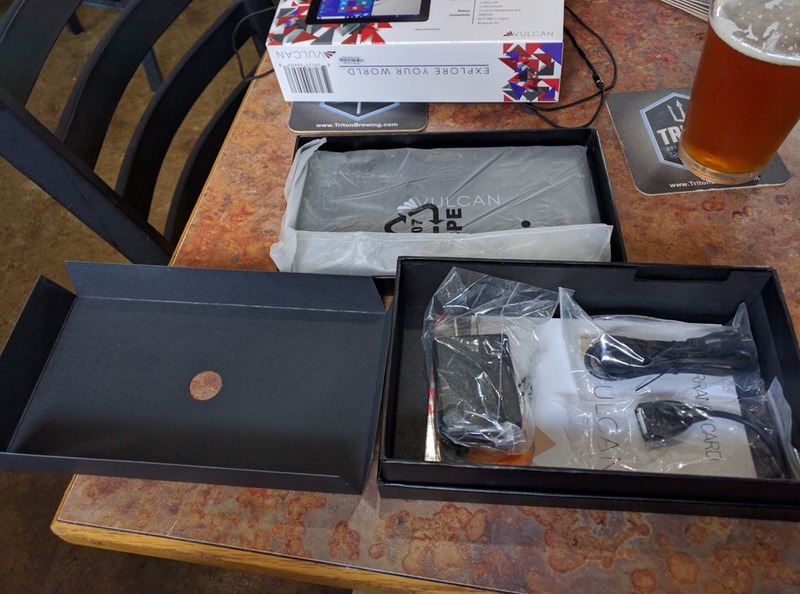 This is a full-fledged Windows 10 tablet with an Intel Atom quad-core chip, which means it’s (theoretically) compatible with nearly any Windows application you can run on your desktop or laptop—it doesn’t have the incompatibility issues you would find with Windows tablets running on ARM like some of the original Surfaces. Since it can use the same web browsers as desktop Windows 10, there’s no need to worry about your browser being incompatible with the forms you might need to fill out on a web site. It’s a Windows 10 computer you can stick in a pocket. While I wouldn’t call it equivalent to a laptop, per se, it’s somewhere on the order of what you could have gotten in an Eee PC a few years ago for about ten times the price. That’s seriously pretty amazing. What’s not so amazing is that you can run into some serious drawbacks trying to make actual use of some of those applications. The tablet only has 16 GB of on-board storage, and 1 GB of RAM—which is seriously little when it comes to trying to run very many applications. If you plan to use this tablet, best to remember those limitations. If you have applications like Skype that like to launch themselves on boot and stay resident, better disable that feature for use with the Journey if you want to get anything done—best just do one or two things at a time. Apart from that, the hardware is similar in a lot of ways to what you get from the Fire. The screen is the same 1024 x 600; the “stereo speaker” is another postage-stamp-sized outlet on the back (and honestly, I think the Fire’s is louder). There’s an SD card slot (though only good for 64 GB, not 128). The tablet’s a little thicker, so it feels a little more cheaply-made, but it’s not bad altogether. Starting with the broad strokes, if you’re planning to get this tablet as a daily-use tablet, I wouldn’t bother. 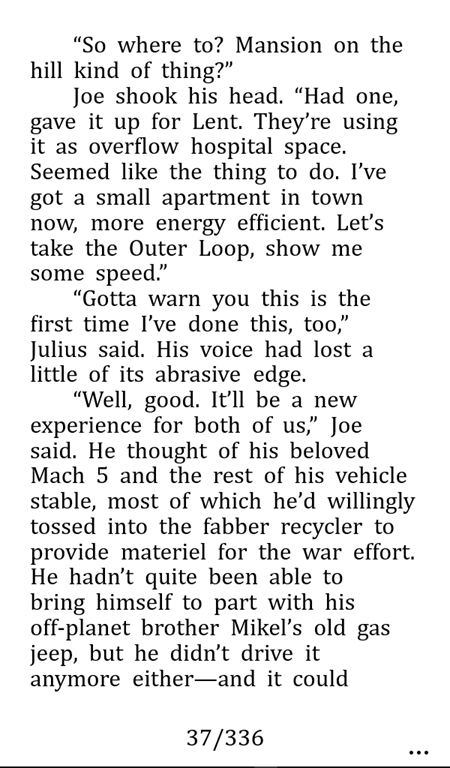 The aforementioned low memory makes it decidedly sluggish. What’s more, I’ve noticed the touch-sensitive screen is somewhat insensitive, and sometimes it doesn’t respond to touch-taps at all. That said, the tablet seems to work better as a micro-laptop. If I hook up my Bluetooth keyboard and mouse to it, and switch off “Tablet Mode” in the Notifications window, I can use it nearly as well as I can my desktop, clicking on things with the mouse pointer. It’s still somewhat sluggish, though. And at least with this particular mouse, the Bluetooth keeps losing connection every so often, requiring me to click a button to get it to notice the mouse is there again. Another thing, which I put down more to my Bluetooth keyboard than the tablet, is that you have to use Fn to get the F keys, so I have to hit Fn + Alt + F4 when I want to close a program. Otherwise it just pops up a Cortana search. One mildly troublesome thing is that the tablet lacks a Windows logo button—the equivalent to an iOS or Android “home” button. It doesn’t make too much of a difference in general operation, as you can usually drag up from the bottom of the screen to expose the status bar, but the only way to take screen captures in tablet form is to hold the volume control and the Windows logo button down. Another odd thing: the tablet doesn’t sleep when I hit the power button. If I hold the power button down, I get a “slide to shut down” screen, but just tapping the button has no effect whatsoever—the screen keeps ticking right along, using up battery power. I suppose I could change that in the Windows power settings when I get around to it, but it’s strange that they didn’t set the defaults to permit sleeping, given that the tablet has a smaller battery (2,500 mAh) than many smartphones. If you’re planning to install many apps—or, indeed, any apps at all—an SD card is also called for. I stuck in a 32 GB card I’d been using for taking photos in my point-and-shoot; it can handle up to a 64 GB card if you should have one available. The one I recommended for use with the Fire would be another good choice here. One handy thing about Windows 10 is that the Settings control panel will allow you to configure the SD card as the future download location for programs, audio, video, and documents, which will help when installing stuff from the Windows store. You can also use the Apps setting screen to move Windows Store apps from internal storage to the SD card pretty easily. However, when installing stuff from desktop app installers, you still need to remember to specify D: as the installation drive rather than C:. That’s a lot better option for space-saving in internal memory than Android or FireOS has. However, if you’re going to do this, you do need to accept that the SD card you plugged in is there to stay, and you can’t simply pop it out to put in one to view pictures from your camera without things going awry. Better invest in a USB or micro-USB SD card reader if that’s your fancy. I also noted that some applications simply wouldn’t give you the choice to install to the SD card, nor would they work properly that way. For example, Google Chrome’s default installer won’t give you the choice of where to install it—it installs on your primary HD by default. So, to prevent it from taking up hundreds of megabytes of internal storage, I instead had to download and use the Google Chrome Portable installer, meant for creating an instance of Chrome on a USB stick for use on public computers. I couldn’t get the desktop version of Dropbox to install or store its Dropbox directory on the SD card, either—the Windows 10 mobile version of the app would install, but that’s just meant for downloading files as needed, not mirroring directories on your device. The Evernote desktop app wouldn’t install that way, either. I installed the version of LibreOffice I use on my desktop, and again, it went onto the SD card and runs just fine. (The tablet comes with mobile versions of Word, Excel, and Powerpoint, but I wanted a more full-featured office suite at hand.) Likewise, most apps I ran from the app store installed okay, too. And I could write via Google Drive/Docs just as handily as I could from the desktop. Indeed, since it recognized the browser I was using as being Chrome for Desktop, it would give me the in-document chat windows that the mobile version won’t. But there are a couple of apps I can’t really run so well—or, at least, I expect I could run the apps if I downloaded them, but because of the SD card issue with Dropbox, I can’t sync the files I’d use them for working with. I keep my Calibre library and my Scrivener writing files in Dropbox folders, and if I can’t sync those folders, there’s no point in running the apps on the tablet. I also can’t get Freda to sync to Dropbox from the tablet, but I can just use the Windows 10 Dropbox app to find and open any EPUB I want to read manually so that won’t be a problem. Speaking of e-reading apps, I tried out three: Freda, Kindle, and Nook. Freda worked just as well as it does on the desktop. I have little doubt I could read an e-book that way reasonably comfortably, provided that the tablet didn’t get too obstreperous about responding to touch-taps when I turned the pages. It was simple enough to set the options to make it look how I wanted, though I did have a little touch trouble setting the colors how I wanted them. The more I use that app, the more impressed I am with it. The Kindle app had a strange issue, though. 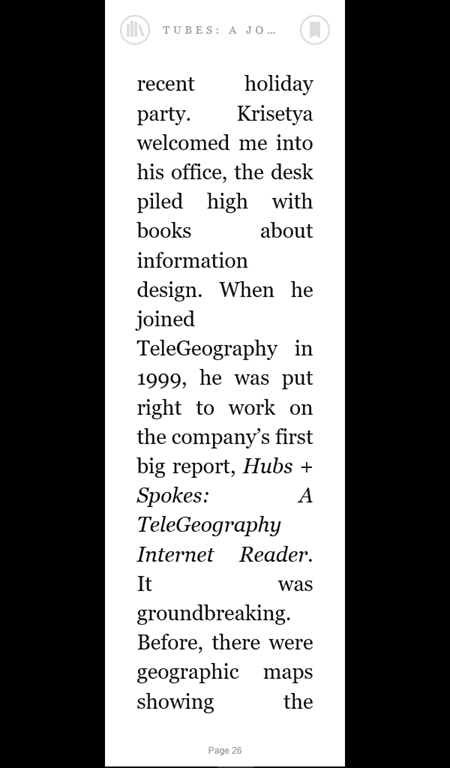 It worked just fine in landscape orientation, but when I switched it to portrait, the window narrowed to about the middle half of the screen—whether I was going through my e-book catalog or reading a book. This seems to be a known issue with Windows 10 tablets, as a Kindle user forum thread about another tablet discusses the same problem without offering any really helpful solutions. The Vulcan or the Fire? On the face of it, it’s an amusing question, given that the Roman God Vulcan was himself associated with fire, via blacksmithing; “volcano” derives from his name. But more seriously, it’s the question to ponder about a tablet this cheap. 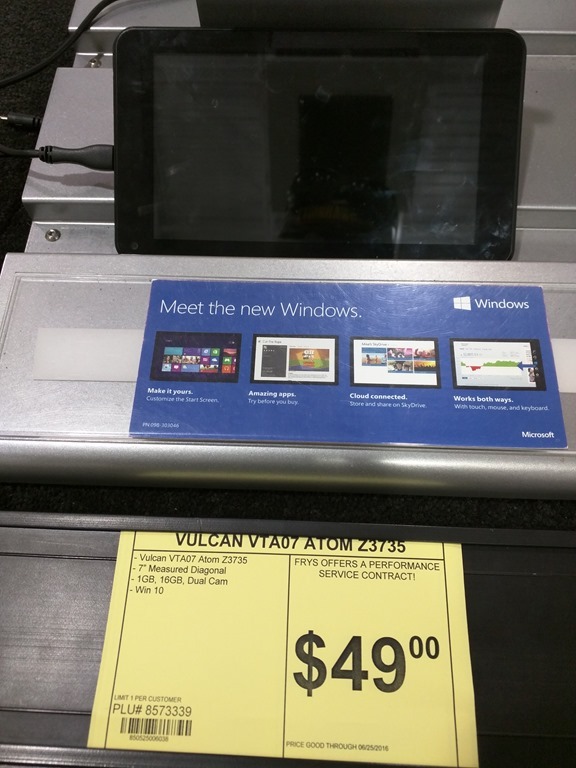 If you have fifty bucks to spend, should you get the Vulcan Journey or the 7” Amazon Fire? And my answer is much the same as it was for the $50 RCA Voyager II Android tablet—for doing basic tablet things, the Fire is just a better deal for your money. 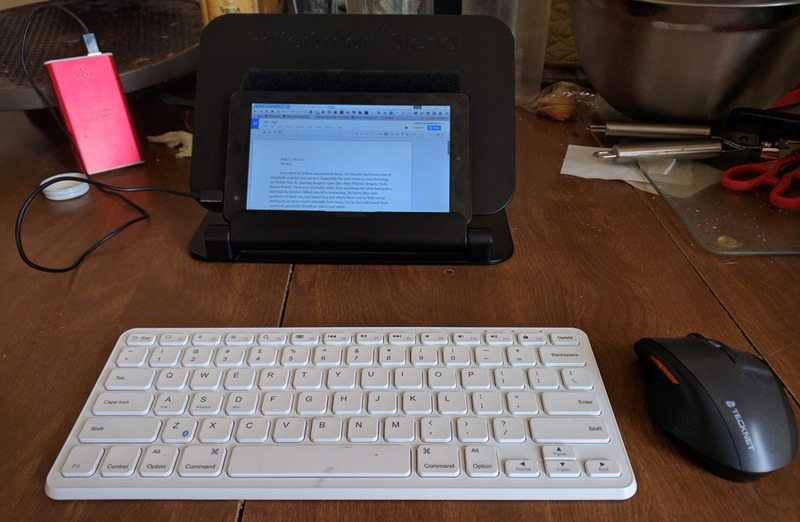 It has better build quality, it feels peppier, and if you’re willing to do a little hacking, it can run nearly any Android app, including any Android e-reader. Windows simply isn’t a great mobile OS—the best benefits I get from this tablet are when I’m using it like a micro-laptop. 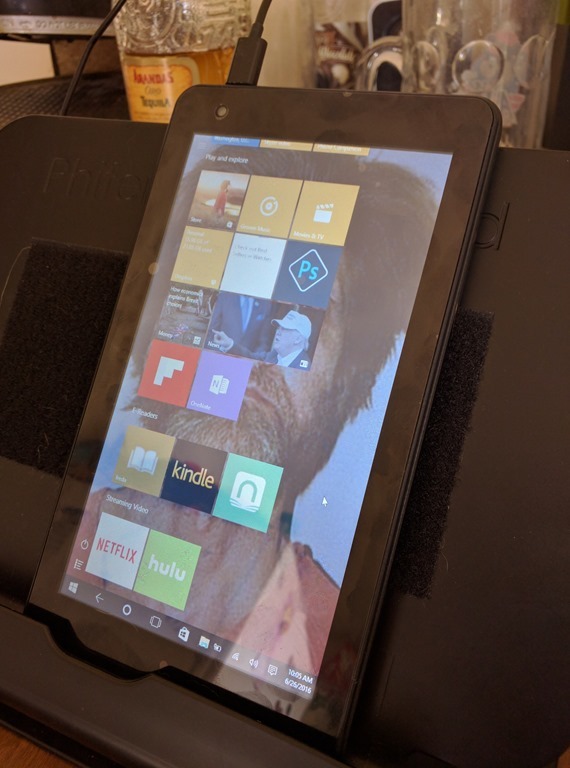 Of course, there are potential specialized use cases for having a $50 Windows tablet, such as if you need the ability to run some app that’s only available for Windows 10 while out on location somewhere—as with me and Live Writer. But that said, if budget isn’t a tight constraint for you, you’d be better off spending a little more money and getting something a little better. For example, this $100 NuVision tablet has a high-definition screen, 32 GB of internal storage, and 2 GB of RAM. But if you want something that can run Windows 10 at a rock-bottom price, no matter how poorly, this tablet effectively seems to be it. 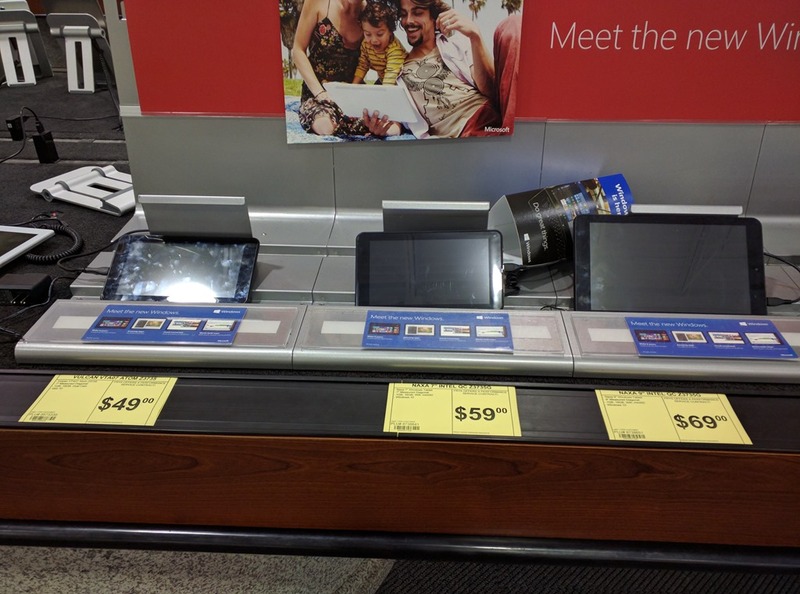 The other tablets in the same price range at Fry’s were from different brands but had basically the same specs, so you’d have to jump up by another $50 or so to get anything better. In any event, we’ve well and truly entered the age of the cheap tablet. And who knows? If Windows 10 can’t find a foothold on smartphones, perhaps there’s still a use case for mobile Windows 10 in the form of such inexpensive tablets. What’s the battery life like? Also, do you know if it can boot from an external card? I might pick up one of these to run Puppy Linux or another small distro. With a 2,500 mAh battery to power a 7″ tablet, it’s not great, but you can get at least a couple of hours out of it. More if you have an external battery pack along. No idea if it can boot from external media, but I’m not sure I’d get my hopes up. Not to my knowledge. In fact, I was completely unable to do so when it came time for me to return the tablet, which meant I couldn’t restore the tablet to its factory original settings.